4 pregnancies. 4 massive body changes. 4 recoveries. As a former college athlete and longtime runner, I had made a lot of assumptions about how I would continue working out and eating healthy during my pregnancies, no problem. But I was wrong about that. Between the nausea, swelling, heartburn and tiredness, the last thing I wanted to do was lace up my sneakers for a run, which was my typical workout. When I actually was motivated to take a run, my body would feel so starved and tired afterwards, I would overeat and be exhausted all day. During my first pregnancy, my runs quickly turned into walks. While it’s always positive to get outside and moving, I could feel the slow decline of my fitness throughout those 9 months. I didn’t learn my lesson after the first pregnancy, because I didn’t know how to adjust my workouts. During my second and third pregnancy, I continued to try and run and push through my exhaustion, even running a 1/2 marathon at 16 weeks during my third pregnancy. I also experimented with pilates, which helped me keep my strength until i realized at 25 weeks that I couldn’t keep up with the core strength exercises anymore. 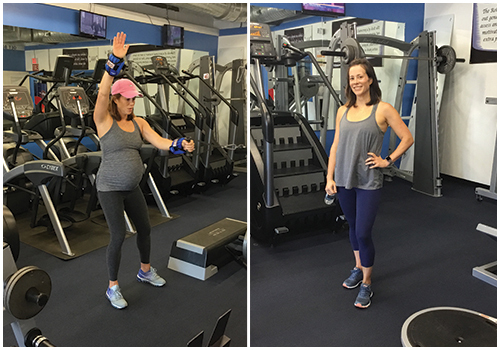 Now that I’m finishing up my fourth and final pregnancy, I can tell you this one felt different, and I finally found something that worked for me- weight lifting and strength training with short bursts of cardio. It’s a regiment that I have continued throughout my 40 weeks of pregnancy, because it was easily changed depending on how I felt that day. It made me feel strong but not overly exhausted after each session. I’m confident that I retained my strength, which will help me have the baby, recover and start building back towards my postnatal fitness goals. It also helped that along the way, I finally realized that working out during pregnancy was no longer about vanity or weight as the scale continued to creep higher each week. My personal motivation was keeping a baseline strength that would help me recover faster after the baby. – Forget any expectations of what you think you’ll be like during your pregnancy. – Experiment with different workouts and have fun. You might be surprised what feels good. Try to keep good habits and consistency but be kind to yourself. Your fitness doesn’t have to be a linear path downwards during pregnancy. Ride the ups and downs of each week. Your mind and body never go back the same way they were. That’s not always a bad thing though. Some things come back better than ever.